Issue #190 • March 6, 2014•Sold Out! When the doctor left, I fed the cats their cornmeal. For Jane’s sake. My wife. Two bullets taken from her body and still she remembered the hunger of our sickly, mewing clowder; still she had the strength to recite her whole tiresome routine to me. Let it cool first, she whispered, holding out her hand, and when I took her hand, Let it cool first, she said again. Well, twelve years prior, I had not let it cool first. I had thought the bastards would have the sense to wait til the cornmeal wasn’t boiling. But they stuck their faces in and ate. One or two got badly splattered, and after that the white scalds on their eyeballs kept them in the dark. Twelve years ago. Those cats long dead, the offspring of their offspring prowl our land. It happened once. How many times had I seen her feed the cats since then? How many thousands of times had the cornmeal cooled? And yet, recovering from her wounds, she called out to me through all those layers of ether, wrapped up in all those layers of gauze, called out to me in an urgent whisper to Let it cool first, as if I would not hear it, as if I could forget the blind cats pawing around in their idiot darkness, as if what she sensed at my very core, when her delirium peeled off all the rest, was a thick and hot and yellow-colored cruelty. 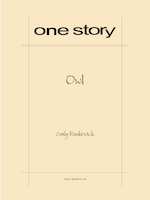 Emily Ruskovich grew up in the Idaho Panhandle. She is the author of two books forthcoming from Random House, an untitled novel and a collection of short stories called Idaho. She is a graduate of the Iowa Writers’ Workshop, and was recently the James C. McCreight fiction fellow at the University of Wisconsin-Madison. She teaches creative writing at the University of Colorado in Denver. When it comes to jealousy, Shakespeare probably said it best: “O, beware, my lord, of jealousy; It is the green-ey’d monster, which doth mock the meat it feeds on.” Just like poor tragic Othello, nothing settles into our souls or breaks us apart more completely than doubt, an emotion that takes center stage in the lyrical and gripping new issue of One Story, “Owl.” Set near Bonners Ferry at the turn of the last century, Emily Ruskovich’s “Owl” is a mystery wrapped in a love triangle wrapped in an historical thriller. A husband cares for his wife, shot in a hunting accident by a group of local boys. But lingering in the air is a puzzle he cannot solve—what was she doing in the woods that night? No matter how he tries, he can’t shake his feelings of suspicion, until they lead to a hunt of his own, and a confrontation that reveals a long-held secret. Be sure to read Emily Ruskovich’s Q&A with us, which explores the connection between her story and Peter Pan—as well as how she developed the distinctive voice for this unforgettable narrator. And next time the green-eyed monster starts to haunt you, remember: Iago may have whispered those famous words to Othello, but it was Othello who clung to them and let them eat away at his heart. HT: Where did the idea for this story come from? ER: I was writing an entirely different story when this one came to me. It was about two little girls—one of them excessively jealous of the other’s goat—living in modern day in Northern Idaho. There was a teenage half-brother, who lived in the woods in a trailer by himself. He was a very peripheral character whom I didn’t know anything about. In a half-hearted attempt at backstory, I wrote this sentence about him: “He had lived in the trailer ever since his mother was shot by a group of boys, who mistook her for an owl.” And there it was. Everything fell away except that sentence—the girls, the goat, the time period, the trailers, the brother. I deleted it all and never went back to it. And then I started fresh, with just that one sentence. ER: The perspective. The first several drafts were in close third-person instead of first, partially because that felt safer. The early drafts were quite reserved and told in a somewhat formal language. The plot was the same—and I had thought that the plot was enough to carry the story through—but in the end I realized those drafts fell flat. Something was missing, and that was a voice. His voice. Then once I had that voice, what I struggled with was telling the story through it. How do you tell a mystery story from the point of view of someone who has since solved the mystery, without simply withholding facts from the reader? I don’t like being tricked in a story, and yet I love mysteries. I wanted this to be an honest voice, a sincere voice, not interested in withholding anything from us. If something was withheld, I wanted it to be because the narrator was too preoccupied with some other aspect of the story, in a very sincere way. But I was so afraid of a cheap “reveal” that I actually did not reveal anything at all. In the draft that One Story accepted, it was clear to me that Jane had run away with her old love, but it would not have been clear to anyone else. So it was through a lot of important but subtle changes, pulling things out, adding little scenes—with the help of Hannah’s very careful editing—that I was able to tell as much as I did about Jane’s disappearance. HT: What did you enjoy the most? ER: There are little bits of my family history in here, and that was fun. From my father’s side, I took the skulls. My great-grandfather, my father’s father’s father, accidentally produced this race of giant-headed cats he called “The Skulls.” The ranch where he lived was really isolated, so the cats kept breeding with one another and as a result developed monstrous heads. He fed them hot oatmeal mixed with grease. They were unfriendly and afraid all the time, except when he came out with the pot of food. Then they clawed up his legs, trying to get to it, sometimes when it was still boiling hot. My father says that my great-grandfather was always a little afraid the cats would eat him. From my mother’s side, I took the coffee ground floor. My great-grandparents—my mother’s mother’s parents—lived in South Dakota in a shack with dirt floors. They discovered that coffee grounds were the only thing that kept the dust down, the dust which otherwise was ruining their lives. HT: The time period for this piece feels so authentic—did you do much research to create the setting for “Owl”? ER: Not at first. I didn’t want my research to influence the tone of the story. So I just wrote blindly through the time period, making up anything I wanted to. It was only once the story was finished that I did any research at all, and that was to correct things. By that time, the story had already taken shape. I wanted it to feel emotionally true to the present, and simply set in the past. HT: The boys in this story are so creepy. Menacing and yet also sympathetic. In that way, they seem to mirror the “skulls” who wander the narrator’s property. They also serve as distractions from the “real” story that is happening behind the scenes. How did the boys factor in as you were writing, and why did you decide to keep Peter hidden for so long? ER: I began writing this story spring of 2011, and have worked on it off and on for almost three years. ER: I am almost finished with the first draft of my novel, which also is sort of a mystery, but not in the traditional sense. It’s about a murder in northern Idaho.